Our objective is to offer customized range of products as per the specifications of our clients. We work closely to fulfill the demands of our clients. We bring a technological innovation of encapsulating actives in millimeter and micron sized beads and capsules which are used in skin care, body care and hair care formulations. With every new challenge that is brought to us we work on offering a new solution. Our team of professionals gives us an edge to develop innovative solutions and products, using a combination of techniques. 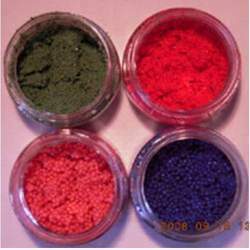 Colors – We customize our products in various colors such as green for herbal, blue for mint, red for carrot oil in accordance with the specifications of or clients. Size range- To maintain the uniformity in our range, we offer a narrow size range. Various delivery formats- We have a number of matrixes based on the end application from which you can choose the possibilities to work with different delivery formats is highlighted further in the brochure.